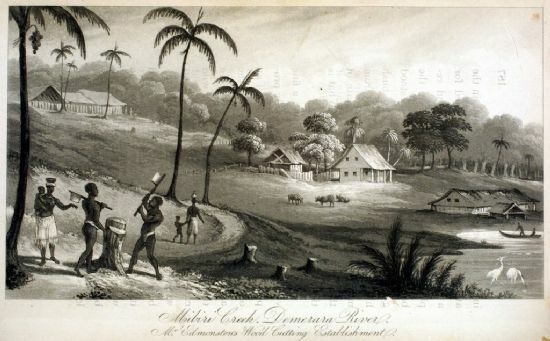 Charles Edmonstone went to Demerara in 1780 and established a timber cutting estate at Mibiri Creek, on the west side of the Demerary River. He married Helen Reid, the daughter of a fellow Scot, William Reid, and 'Princess' Minda, the daughter of an Arawak chief. According to the introduction by J G Wood to the 1882 edition of Charles Waterton's Wanderings in South America, Reid was from Banffshire. His connection with the Arawaks made him a natural leader of expeditions to hunt down maroons [runaway slaves], since these relied on the skills of the local tribes in tracking through the rain forest. His first came to prominence after the expedition of 1801 in which he was shot and injured, but survived with the bullets lodged in his body. Presented to CHARLES EDMONSTONE, Esq., by the Governor and Court of Policy of the Colony of Demerara, as a token of their esteem and the deep sense they entertain of the very great activity and spirit manifested by him, on various occasions, in his successful exertions for the internal security of the Colony. --January 1st, 1809. A Token of Gratitude, from the Inhabitants of Demerary, to Charles Edmonstone, Esqr. whose integrity, and many excellent qualities, during a residence of 37 years in the colony,gained their sincere esteem: his prudence and humanity, entitled him to the command of repeated expeditions, against the revolted negroes of Guiana; and his courage, always ensured success. In 1808 Edmonstone was visited by Thomas Staunton St Clair, who sketched the plantation. No words of his can do justice to the hospitality of that gentleman, whose repeated encounters with the hostile negroes in the forest have been publicly rewarded and will be remembered in the colony for years to come. Waterton also revisited Mibiri Creek in 1820 and described the now ruined house. The house had been abandoned for some years. On arriving at the hill, the remembrance of scenes long past and gone naturally broke in upon the mind. All was changed: the house was in ruins and gradually sinking under the influence of the sun and rain; the roof had nearly fallen in; and the room, where once governors and generals had caroused, was now dismantled and tenanted by the vampire [bat]. Edmonstone and his half-Arawak wife, Helen Reid, had two sons and four daughters, all except the youngest, Bethia, born in Demerara. They returned to Scotland to live at Cardross park, Dunbarton-shire. The baptisms of Eliza (born 1808) and Anne (born 1810) were recorded at Cardross in 1827. Anne was later to marry Charles Waterton. The last years of Charles Edmonstone and his wife Helen at Cardross Park were unhappy. The couple quarrelled over their slaves in Demerara and Charles’s plan to free one of his female slaves failed because Helen claimed ownership. Helen had also become addicted to opium and, after Charles’ death in 1827, lived the rest of her life in seclusion. Edmonstone's estate was valued at £44,368 1s 9d, of which £8,133 6s 8d was from the sale of his woodland and slaves in Demerara.